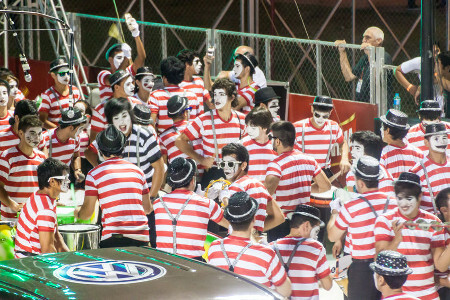 Home 2018 ¿Dónde está Wally? Carnival time in February (usually) is a particularly festive occasion as it’s in the height of summer. The city’s usual population of 120,000 nearly doubles during that time, with clubs competing against each other in the keynote parade, where they’re judged on originality, design, charisma, dance, rhythm, beauty and elegance. This club appears to answer all the Where’s Wally? puzzles at once! This entry was posted	on Monday 27 August 2018 at 13:29	and is filed under 2018, British Expat Latest, Paraguay. You can follow any responses to this entry through the RSS 2.0 feed. You can leave a response, or trackback from your own site.